WordPress vs Medium ― Which Publishing Platform Is For You in 2019? WordPress vs Medium? Picking the right platform for your project will definitely help you succeed faster. Each platform has its advantages, so spending more time on research is a must if you want to create an impactful online presence. In this article, we will dive deep to learn about WordPress and Medium, how they differ and which one to choose. Founded in 2004 by Matt Mullenweg and Mike Little, WordPress is a free, versatile, open source platform used by millions of people – from personal bloggers to big companies like Microsoft. That being said, WordPress is suitable for any type of website you want to run. In fact, flexibility is one of WordPress’ advantages. Medium was founded in 2012 by Evan Williams ― the man behind Twitter and Blogger. With the same spirit to encourage people to share ideas online, Medium is the platform that rewards high-quality content in an attempt to create a more informed society. As stated on their website, this platform is for writers and storytellers. However, businesses that focus on content distribution will find Medium useful too. When it comes to WordPress vs Medium, that is just a tip of the iceberg. Let’s dive deep. I bet you already know that 33% of all the websites use WordPress, right? It is indeed the most popular platform on this planet. But first, let’s make things clear that here we talk about WordPress.org, not WordPress.com. The first is a content management system (CMS) ― often called self-hosted WordPress ― that you install on your web hosting service to take your website live, placing it on the internet. The later is a web hosting site. You can learn more in this article. Let’s continue on. Why is WordPress so popular? One of the reasons is flexibility. WordPress can create nearly any kind of website to publish your content. As mentioned earlier, besides personal blogs, you can create online shops, travel blogs, membership sites and more. Not only that, WordPress has a great feature called user management. With this feature, website owners can manage users by deciding who has the authority to write posts and who can moderate the comments. While personal bloggers might not need this, for a business, this feature is very important. As a younger platform, Medium boasts its simplicity ― both for readers and publishers. The good thing about Medium is that it has a built-in audience. If you create a website from scratch, you might need to struggle to establish your online presence. In fact, it may take years to reach the right audience. When using Medium, you can build an audience faster as long as you publish great content. The key is to make as many friends as possible. What is more, you can build a bigger audience by using the recommendation system. 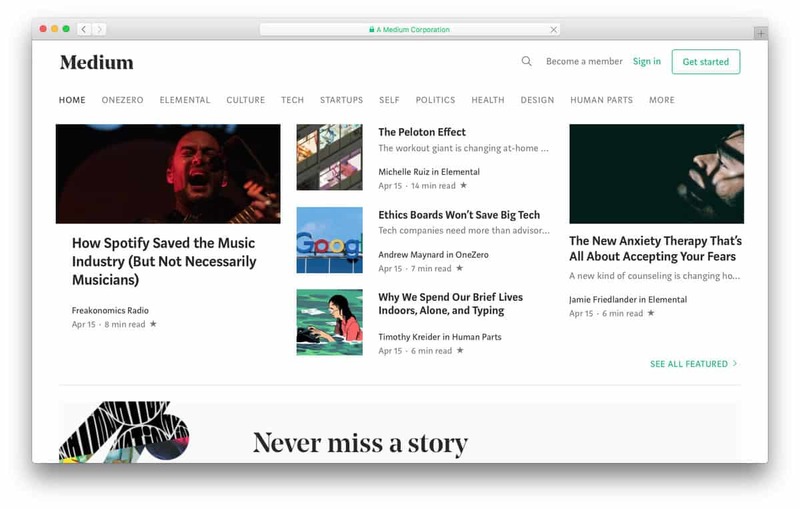 Medium implements a content-based filtering system to help readers get relevant content based on their interests. That being said, readers will only follow you if they like your content. Another thing is the Clap― a rating system. With the clap, you can measure reader engagement. The more, the better. It gives you insights on which article is good and which one needs to be improved. WordPress vs Medium: How do They Differ? WordPress and Medium have different approaches to how they function. Before choosing which one is the most suitable for your needs, let’s see how they differ. As an all-around platform, WordPress might request some beginners to learn a bit. While the installation and setup process is easy, when learning advanced features though, there is a learning curve. Luckily, you can find many places to learn WordPress online. Overall, WordPress is easy to use. 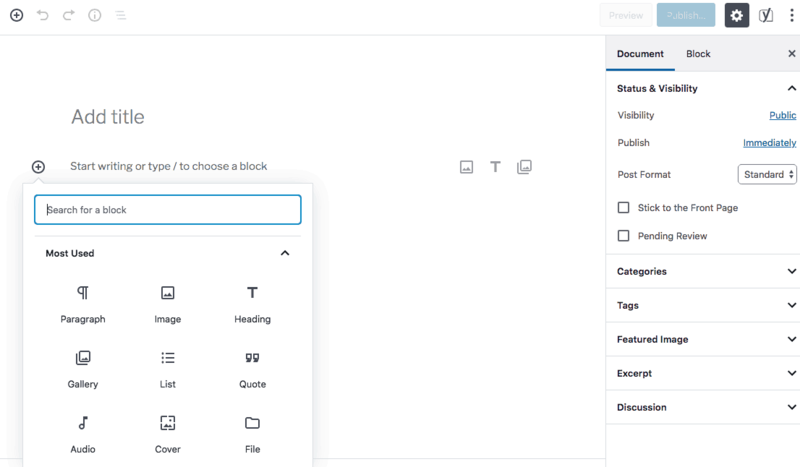 With its newly introduced Gutenberg editor, publishing a post becomes even easier. On the other hand, Medium doesn’t require to install anything. Built to help writers share their ideas, once signed up, you can start writing. Posting content on Medium is also a breeze with its minimalist distraction free-editor. One of the clear distinctions when considering WordPress vs Medium is website ownership. When using WordPress, your website along with the data stored in your hosting account is completely yours, excluding cases where the law is violated. Customization is a highly importand deciding factor when picking between WordPress vs Medium. One of the main reasons why people use WordPress is the abundance of plugins and themes available. By using these options, you can personalize your website to stand out from the competition. Medium lets you choose your blogs’ layout, add a logo, and image heading, and that’s it. You don’t get nearly as many options as you would with WordPress. With Medium, it’s all about minimalism and the quality of content. Again, using WordPress requires you to start from scratch, meaning there might be no visitors on your launch day. But you definitely can grow it out into a massive website. Building an audience is all on you. When running a WordPress site you should definitely take the time to learn SEO. Understanding SEO will help you make your website easy to find by achieving a better search engine rank. As previously mentioned, with Medium, building an audience is easier. People come to Medium for content, hence the site attracts more than 200 million readers every month. That being said, if you have great posts, you can definitely benefit from Mediums’ popularity. WordPress offers you a lot of options for monetization such as from Google Adsense, renting space and affiliate marketing. When using Medium, the options are a bit limited. Medium has a Partner Program where you can start earning money based on how members engage with your stories. Or, if you integrate your account with Twitter, you have the chance of landing freelance jobs from your readers. When picking between WordPress vs Medium you have to keep in mind one important element – site security. 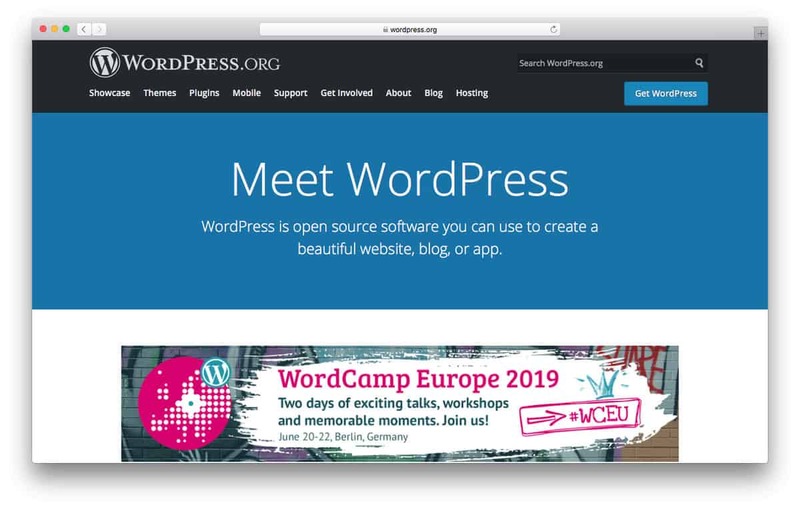 Remember that WordPress is a self-hosted platform. That means you are in full control of your website, including security. While you might hear that most attackers are targeting WordPress, as long as you use the latest version, you will reduce the threat. On that note, because it is not as popular as WordPress, the attacks on Medium are fewer. In addition, Medium maintains a secure server for your data and uses encryption to protect data transmission. If you’re not sure which is a better choice when it comes to WordPress vs Medium, always think about customer support. WordPress has amazing community support that will help you when facing issues. They also have tons of documentation that might answer your questions. In short, there’s no problem too hard to solve when using WordPress. In addition, most hosting providers love WordPress, and dedicate entire knowledge base and tutorial sections for the platform, all the while training their support agents to help with the most common issues. With Medium, you have the option to request support from their team. WordPress vs Medium: Which One Should You Choose? When it comes to choosing between WordPress vs Medium there are a couple of things to keep in mind. Basically, WordPress and Medium are two remarkable platforms for content publishing. You can use them both to build your brand and get similar results. Keep in mind that these two platforms are used for different purposes. So, if you have to choose between them, you need to make sure that the platform suits your needs – the versatility of WordPress or the simplicity of Medium. That being said, if you really like sharing ideas with the world and getting more engagement without thinking about monetization, Medium is for you. It’s simple, easy to start using and won’t hinder you. On the contrary, if making money online is your main goal when running a website, WordPress offers better monetization options. Also, if you care about keeping your intellectual property safe, and want always to have full control of it while building a flexible platform – go with WordPress. WordPress vs Medium is still a hot topic when discussing the publishing of content online. Each platform has its pros and cons. Using both platforms can definitely be a great idea. But, if you have to choose, make sure to pick the option that fits your needs better. For those who want to create content without options and customization, and don’t look to monetization as a priority, Medium is an excellent platform for your content. Meanwhile, those of you who want to have total control on your website and plan to monetize it, the time tested WordPress platform is the best option.